New World’s ISOLATE 30 minute fire door is available in 7 styles in a range of colours. ISOLATE is a 44mm thick door leaf made up of 2 GRP skins with an engineered timber core, set into a 70mm hardwood frame which is tested to BS EN 942. ISOLATE skins feature a distinctive grain definition and moulding detail. 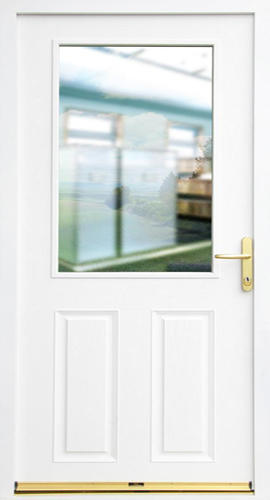 ISOLATE is also available as a glazed door in 4 styles with a single glass pane of 7mm clear Pyroglass. Pyroglass is a clear fire-resistant glass offering integrity and partial insulation with impact safety through a specially designed laminated intumescent layer. Personal safety is a high consideration and the ISOLATE door features multi-point high security locking mechanisms and discreet flush fit 2D hinges. ISOLATE has achieved Secured by Design accreditation. A wooden 15mm Part M compliant low threshold is used on all ISOLATE doors and an overhead door closer is fitted as standard.